At Kingswood Primary Academy we aim for all pupils to become happy, confident learners so that they can progress and reach their full potential. Every child is unique and some children may have individual needs that may affect their learning. Some children may need extra support with their learning and here at Kingswood we strive to provide the best nurture and support to help give children the necessary skills to catch up with other children of the same age. Support is provided through individual and group sessions which may be delivered both in or out of the classroom. There is a dedicated team of staff who deliver targeted intervention groups and children will be monitored closely to look at progress and what special support they need. Some children will also be part of the schools Special Educational Needs (SEN) register which provides personalised targets to work on primary areas of need. The school aspires to maintain close links with parents and to provide appropriate support based upon the views of staff, parents and the child. What does Kingswood Primary Academy offer children with special educational needs or disabilities? What happens if my child has difficulty learning? Identification of pupils with SEND and what happens when we are concerned about children's learning. 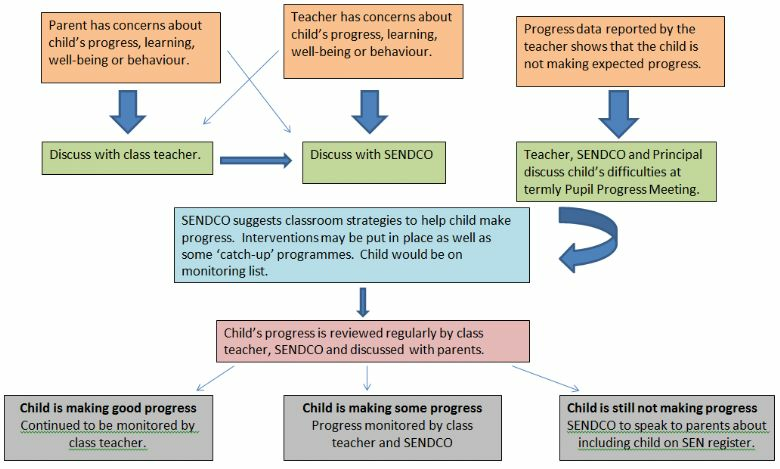 This flow diagram shows what happens if a parent or teacher has concerns about a child’s learning. Parents are encouraged to talk to their child’s teacher or make an appointment to see the SENDCo directly. If your child has SEND then they may require support that is 'additional to and different' from the rest of the class. This does not necessarily mean that they will need to be taught outside the classroom. Teachers plan learning activities that are pitched at a level so that all children can access them and so that all children are appropriately challenged in order to take their learning forward. 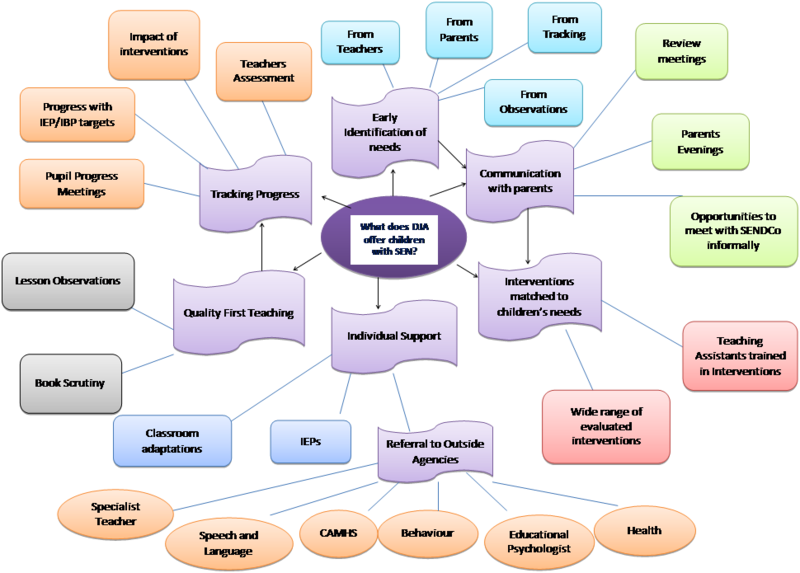 Teachers use a range of different strategies to support children in order from them to be included in the learning and activities with their peers. Evaluating the Effectiveness of the provision for children with SEND. Review meetings and pupil progress meetings. The first thing to do if you are unhappy with something at school is to speak to your child's class teacher and/or the school SENDCo. Miss Kamel is responsible for co-ordinating provision for children with SEND. If you are still unhappy you should talk to the Principal. If you can not resolve a problem informally, ask for a copy of the academy's complaints procedure. Your local parent partnership service (PPS) will be able to support and advise you through making a complaint. There is a PPS is every local authority, who provide confidential and impartial information, advice and support to parents and carers of children and young people with SEND.